The Georgia Bulldogs weren’t anything special this year in their first season under head coach Smart, but the positive this squad can take away was their on and off strong defensive showings. Georgia ranks 16th in the nation in total defense, while their offense was a work in progress under a freshman QB, ranking 88th in the nation in offensive production. 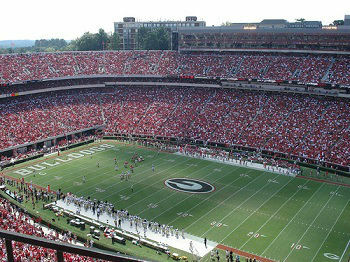 In their regular season finale Georgia came up short at home against rival Georgia Tech losing to the Yellow Jackets by a final of 27-28 finishing the campaign 7-5 overall. Georgia went 4-4 in the SEC coming out of the weaker East division. Before their last defeat Georgia had built some momentum winning three straight including a nice 13-7 win over Auburn. QB Jacob Eason was adequate throwing for 2,266 yards and 14 TDs to 8 INTs. The TCU Horned Frogs came up well short of their lofty preseason ranking as the Horned Frogs struggled with consistency, especially on the defensive side of the ball, finishing the regular season standing 6-6 overall. TCU has lost in 4 of their last 6 games with their two wins during this stretch coming on the road against disgruntled Big 12 squads Baylor and Texas. In their regular season finale the Horned Frogs fell flat losing to Kansas State by a final of 6-30. TCU has put up respectable offensive numbers this season ranking 23rd in the nation in offensive production, while the defense ranked 75th in yards allowed. QB Kenny Hill was streaky throwing for 3,062 yards and 15 TDs to 13 INTs, while also rushing for 537 yards and 9 TDs. This isn’t the most intriguing bowl matchup in today’s action, but has the ingredients to be a competitive matchup. Both squads have reasons to be motivated for the postseason as they try and build off of some momentum heading into the offseason. We’ll side with the strength of the Georgia defense as they go on to cover this spread against the Horned Frogs. What's everyone think of the Stanford/NC game? I think Standford's ability to run the ball even without McCaffery gives them the edge. NC QB won't do anything to hurt his draft status, he's already projected #1.
north carolina, s. alabama, nebraska. My lean is on Michigan as i think they are just going to load the box and shut Dalvin Cook down and make them beat them through the air. Maybe a healthy Kenny Hill?